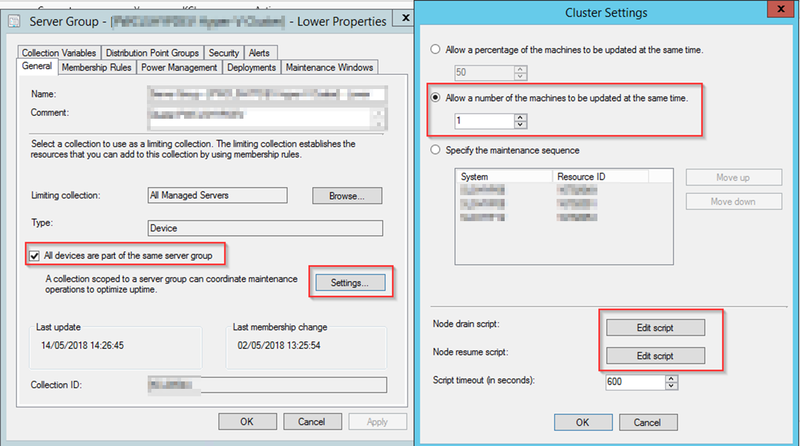 Within SCCM Assets and Compliance you can create a collection containing Server Client membership. Once the 'Server Group' feature is enabled the properties of the collection will contain an additional option to declare that all members of the collection are part of a server group. This means SCCM knows that the servers within this collection must be treated with specific logic and settings. In the example below the collection contains three nodes of a cluster and only one node may be Software Updated at a time. Once policy is received for the Software Update Group deployment an election is held in which one of the nodes will engage a lock state forcing the other nodes to wait until it has been released. The UpdatesDeployment.log details the 'Lock State'. Once the node has taken the lock (Lock State: 1) the server will then run the 'Node Drain Script' and continue if the script has an exit code of 0 zero or if the script times out (600 seconds default). After the main deployment is complete the 'Node resume script' is run and the lock state is returned to 2. The SQL script below will report on all Server Groups with Pre and Post Actions as well as current client Lock states. Your script won't fit as a collection setting, it is limited to 255 characters. 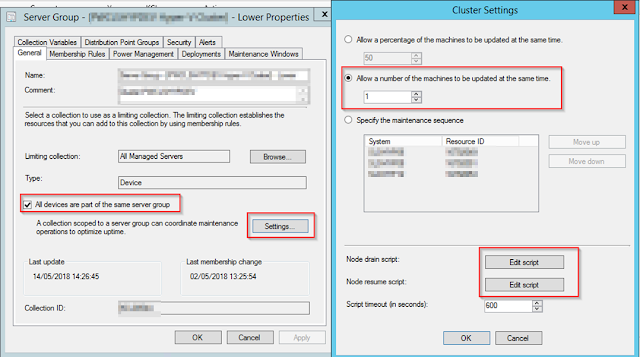 For better details see https://insights.adaptiva.com/2018/configmgr-server-group-patching/.